Ardnamurchan Central Complex. Bedrock and Superficial deposits. 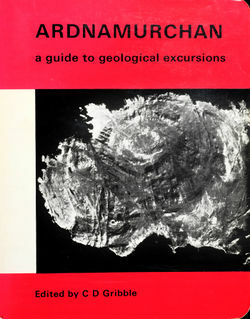 1:25.000 geology series. 2.1 Locality 1 [NM 465 623]. 2.1.1 Locality 1A [NM 465 623]. 2.1.2 Locality 1B [NM 461 623]. 2.1.3 Locality 1C [NM 455 626]. 2.2 Locality 2 [NM 467 624]. 2.3 Locality 3 [NM 469 625]. 2.4 Locality 4 [NM 470 626]. 2.5 Locality 5 [NM 471 628]. 2.6 Locality 6 [NM 473 629]. 3.1 Locality 7 [NM 494 626]. 3.2 Locality 8 [NM 493 626]. 3.3 Locality 9 [NM 492 627]. 3.4 Locality 10 [NM 484 628]. 3.5 Locality 11 [NM 485 630]. 4.1 Locality 12 [NM 503 631]. 4.2 Locality 13 [NM 504 630]. 4.3 Locality 14 [NM 506 629]. This excursion provides an opportunity to examine the Mesozoic sediments, Tertiary basalts and Moine schists which are host to the intrusive complex. Also present are a variety of composite intrusions, some possibly related to Centre 1 activity, others comprising part of the Centre 2 cone-sheet and sill suite. In this area is developed possibly the most spectacular series of cone-sheets to be seen in the British Isles. Apart from the composite members these are mostly non-porphyritic quartz-dolerites, although a few porphyritic dolerites are also present. Early and late dykes of a variety of types are found both cutting and cut by the cone-sheets. To take full advantage of the exposures available on this excursion the localities around Mingary Pier, Glas Eilean and Mingary Castle should be visited at low tide. Total distance (Kilchoan-Kilchoan) about 18 km, although about half of this distance can be travelled by car. The Mesozoic rocks and Tertiary igneous rocks of Sron Bheag (based on Richey et al. 1930). From Kilchoan, where parking is possible opposite the access to the old jetty by the shops, follow the road south­west to Ormsaigbeg and thence along the coast path for about 300 m until access is afforded to the shore via a small headland. 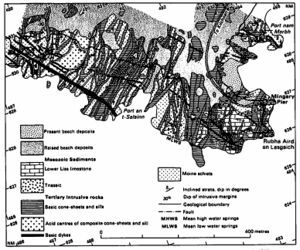 Figure 10 shows the geology of the area in detail. Locality 1 [NM 465 623]. The small headland consists of a massive quartz-dolerite dyke which trends north-west, flanked on either side by granophyre. Although the contact between these components in some places is sharp, it is more frequently indistinct, with brecciation of the basic rock and intrusion by acid veins. Extensive hybridization between the two components also occurs, best seen above the face forming the south-west side of the headland. As a composite intrusion it is unusual in that the acid material occupies a marginal relationship with respect to the earlier basic component. Access note Exposures along the coast to the west of the small headland may be reached only at low tide, and therefore cannot form an integral part of the whole excursion. However, the area may be visited separately. Some parts of the coast are difficult to negotiate. Locality 1A [NM 465 623]. In the cliff immediately to the west of the western granophyre of the small headland. shales are present which may be part of the Great Estuarine Series. Locality 1B [NM 461 623]. In the bay to the north-west of the main headland of Sron Bheag the sedimentary succession at shore level consists of sandstones. flags and limestones of Inferior Oolite age. Higher in the cliff a Tertiary basalt is found. Immediately beneath this basalt a mudstone. with a thin ironstone band. overlies a white sandstone. Both these sediments are probably of Tertiary age. Interesting age relationships between dykes and cone-sheets are present on the shore. where a north-north-east trending porphyritic basalt dyke cuts the Mesozoic sediments and is. in turn. cut by quartz-dolerite cone-sheets. Both dyke and cone-sheets have then been cut by a xenolithic non-porphyritic quartz­dolerite dyke. Locality 1C [NM 455 626]. Continue north-westwards for about 750 m across the Bajocian sediments (Inferior Oolite Series) which are cut by an early composite dyke and by many cone­sheets of the outer suite of Centre 2. Just after crossing an acid intrusion. Toarcian shales (Upper Lias) outcrop with the Raasay Ironstone. This is about 1 m thick and largely altered to magnetite, but the remains of belemnites are still preserved. Return to Ormsaigbeg by retracing the outward route. as the cliff path marked in Figure 10 is hazardous. Locality 2 [NM 467 624]. From the large composite intrusion proceed north-eastwards for about 250 m to reach the lower part of the Inferior Oolite Series. This consists of limestones overlying calcareous sandstones. The limestones are fossiliferous, yielding belemnites and ammonites. Locality 3 [NM 469 625]. Follow the outcrop of the Inferior Oolite Series to the north-east to the point where the sediments are cut by a composite sheet. This has well­defined basic margins about 0.5 m thick and an acid interior measuring about 2 m across. The margins consist of fairly basic quartz-dolerite, while the interior is a far more acid quartz-dolerite. The central part of the sheet is locally highly xenolithic. Locality 4 [NM 470 626]. Continue north-eastwards along the coast for about 100 m. Just to the south-west of a marked ridge formed by an easterly dipping quartz-dolerite sheet, dark shales occur as lenticular patches within a cone-sheet complex. These shales are of Toarcian age and yield ammonites of the Harpoceras falciferum zone. Within the shales is found an oolitic limey ironstone. Like that seen to the west of Sron Bheag, this is also correlated with the Raasay Ironstone. Locality 5 [NM 471 628]. Cross the quartz-dolerite ridge and then a wide pebble beach to fine-grained white sandstone of Domerian age (Scalpa Sandstone) which occurs in disconnected outcrops near low water mark. In this area a porphyritic dolerite dyke trending north-westerly is seen to be continuous with a cone-sheet of the same type. A pitchstone dyke cuts this cone-sheet; it has glassy margins free from spherulites and a banded spherulitic glass interior. Porphyritic dolerite cone-sheets predominate to the west and inland of this locality, while to the east they are mainly non-porphyritic. Locality 6 [NM 473 629]. North-eastwards towards the old jetty at Kilchoan, sandy micaceous shales occur with occasional calcareous sandstones representative of the Lower Pliensbachian (Pabba Beds). The beds dip to the south at about 30°, the structure forming part of the elongate dome which trends north-eastwards across the centre of the complex. Amongst many acid and basic dykes which cut these shales, a 10 m thick north-west trending olivine­dolerite, which occurs about 200 m north-east of the pebble beach near Locality 5, is of significance. This dyke is cut by pink aplite/pegmatite veins and contains amygdales which consist of a lining of perthite, and a centre of prehnite, separated by a zone of small colourless garnets. The outer cone-sheets of Centre 2. Mingary Pier area (based on Richey el al. 1930). At the site of the old jetty regain the main road and proceed eastwards. Just before the Kilchoan Hotel turn right towards Mingary Pier, where vehicles may be parked. Gain access to the shore south of the pier by means of the gate adjacent to the ferry house. 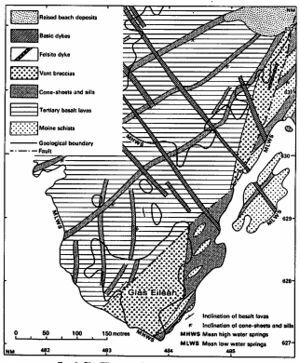 Figure 11 shows the geology of the area south and west of the pier and Figure 4 the geology around Glas Eilean. Locality 7 [NM 494 626]. About 60 m south of the pier the lower half of a composite sill is visible, the upper half being cut off by a massive basic sill probably connected with the cone-sheets. The best exposure is below and to the east of the basic sill. The composite sill consists of a basic quartz­dolerite margin about 0.5 m thick, chilled externally against the host rock, and internally showing both sharp and gradational contacts with a granophyre. The internal junction shows no chilling effects. The granophyre contains abundant. more or less rounded. basic xenoliths which are characteristic of the marginal zone. These become smaller and more leucocratic away from the margin, with the centre of the granophyre practically free of inclusions. Locality 8 [NM 493 626]. Cross over the massive basic sill to the southern extremity of the shore some 150 m from the pier, where a cone-sheet about 7 m thick exhibits composite structure. The outer 2 m on both sides consists of a coarse­textured, spheroidally weathering rock and well-chilled margins. The internal 3 m exhibits vertical jointing with the centre containing a lenticular xenolithic mass. The outer and inner sections are both composed of fairly basic quartz­dolerite, but the xenolithic centre is a more acid quartz­dolerite. The xenoliths are mainly Moine schists, which develop a reaction rim of augite and quartz. In the calcareous shales overlying this intrusion, contact metamorphism has resulted in the growth of garnet, clino­pyroxene, idocrase, tremolite and prehnite. Locality 9 [NM 492 627]. Continue westwards for about 100 m to a rocky/pebble bay just south of the cairn. In the small face above the high water mark. fractures parallel to the adjacent cone-sheets are seen cutting the Lower Lias sediments in which thin limestones occur. The beds of limestone can he easily followed across the fractures. showing that no vertical displacement has occured along them. Elsewhere, fractures ocupied by cone-sheets show displacement of the walls in a vertical sense. On the shore below this exposure an early dyke of big-feldspar basalt can be found, crowded with phenocrysts of labradorite up to a few centimetres long, and cut by cone-sheets which are chilled against it. Locality 10 [NM 484 628]. Follow the coast north-westwards for about 700 m across a complex of cone-sheets, sills and dykes cutting the Moine schists to the pebble beach of Port na Luinge. Thence turn south and cross to the small tidal island of Glas Eilean (a clear path through the seaweed is present near the highest part of the beach). Vent agglomerate is well displayed on the island, fault-bounded against basalt on its northern and western margins, but with the original vent walls preserved to the south and east, where the host rock consists of Moine schists cut by quartz­dolerite cone-sheets. The agglomerate contains blocks of Moine schist, basalt, Jurassic limestone, sandstone and shale, as well as quartz-dolerite. The fragments are mostly angular and thoroughly mixed, with acid tuff infilling all the cracks and crevices. Acid veining occurs over a moderate area near the central part of the eastern margin. Fragments of acid rock are found in the agglomerate near the southern end of the western margin, which are possibly parts of an earlier composite cone-sheet. Ash occurs above high water mark in the central part of the outcrop near the southern shore. Locality 11 [NM 485 630]. Return to the mainland and follow the high water line along the eastern shore to a point about 100 m from Port na Luinge and the reappearance of a north-easterly extenslon of the Glas Eilean vent agglomerate. Here, the eastern margin is fault-bounded against Moine schists cut by quartz-dolerite cone-sheets, while the western margin against basalt appears to be the original vent wall. The features of the agglomerate are similar to those seen on Glas Eilean, but the central part of this outcrop, occupying a rather flat topographic area below high water mark, shows the presence of a tuffisite dyke cutting the agglomerate. A fluxion structure parallel to the walls is present within the dyke, and contacts with the agglomerate may be either sharp or gradational. Inclusions of fragments of agglomerate are common. Evidence of emplacement in a fluidized system is apparent. The vent is considered to be related to Centre 2 principally from the parallelism of its trend with the adjacent Centre 2 cone­sheets. 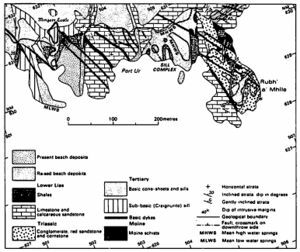 Geology of the shore area near Mingary Castle (based un Richey et al.). Glas Eilean vent (based on Richey et al. 1930). By the Kilchoan Hotel turn right for Salen and after about 1 km right again for Mingary Farm and Mingary Castle. Vehicles should be parked on the left of the road before crossing the cattle grid. Follow the direction signs for Mingary Castle. The castle, now in a ruined condition (although some restoration work has recently beaen carried out was originally the stronghold of the MacIans of Ardnamurchan. James IV received submission of the Island Chiefs here in 1493 and 1495. Beseiged by MacDonald of Lochalsh in 1517 and by Maclean of Duart in 1588, the castle passed to the Campbells under the Earl of Argyll in 1625. Acquired by James Riddell of Riddell Lodge, Berwickshire, in 1760, it was still roofed and habitable in the mid 19th century (Wilson 1973). Access to the shore may be achieved through the castle. 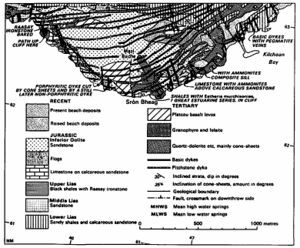 Figure 12 shows the geology of the area. Locality 12 [NM 503 631]. A thick sheet consisting of a greenish­grey rock of granophyric type occurs beneath Mingary Castle. The rock is similar to the acid craignurites of Mull, and is thus considered to be a granophyre of craignurite affinity. Locality 13 [NM 504 630]. Continue eastwards along the shore where Lower Lias limestones showing honeycomb weathering and containing shaly layers pass upwards into Lower Lias shales. The shales are cut by a multiple quartz-dolerite sill complex. Locality 14 [NM 506 629]. If the tide is suitable, cross to the tidal islands of Rubha a' Mhile. On the eastern side of the northern island, below high water mark, Triassic red sandstone and conglomerate about 6 m thick can be seen resting on Moine schists with the development of a basal breccia. Both the Moine schists and Triassic sediments are cut by north trending cone-sheets, which themselves are cut by a north-west trending basic dyke. At the southern end of the southern island, a Triassic cornstone is overlain by a pebbly sandstone. This sandstone, in turn, is overlain by white sandstone and sandy limestone of Lower Lias age. The Lower Lias sediments are cut by a quartz-dolerite sill which can be traced into a cone-sheet, to the north-east, with a north­east trend. This sill/cone-sheet cuts a north-westerly basic dyke, but is itself cut by a north trending cone-sheet. This page was last modified on 14 December 2015, at 00:31.